12:30: The first band we manage to catch of the day is US pop rockers Madina Lake, who are of course a man down after the recent hospitalisation of bassist Matthew Leone. They're giving a reassuringly rousing reception, and in return they deliver 30 minutes of stadium-ready anthems in what is a genuinely emotional performance. 13:30: And now time for something completely different. After the success of Abba tribute Bjorn Again at last year's Sonisphere, the powers that be this year draft in the Fab Beatles for a spot of light relief. It works to a degree ('Hey Jude' in particular is a singalong moment), but their 30-minute set is a little too long, and it's all a little too out of place, even if they do end with a snippet of Iron Maiden's 'Run To The Hills'. 14:40: After a dose of the Fab Four we're hotfooting it back to catch up with Dean Butterworth and KJ Sawka, again look out for what they had to say on this site and in Rhythm over the coming months. 16:45: We emerge bleary-eyed from this press area to the sound of Alice In Chains rockin' the main stage with a set heavy on tracks from last year's awesome Black Gives Way To Blue album. There's also a few classics, 'Rooster' and 'Them Bones' to name but two, as Sean Kinney and co absolutely nail their performance from start to finish. 17:30: Amidst more running around backstage we manage to catch glimpses of The Cult, who sound monstrous, John Tempesta's kit in particular, before the moment all of Knebworth has seemingly been waiting for - the arrival of Iron Maiden. 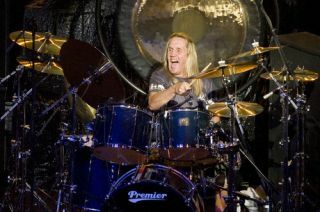 Nicko leads the veteran metallers (although they show no sign of slowing down despite their advancing years) through a set filled with post-2000 material, in fact there's not even room for festival staple 'Run To The Hills' (good job the Fab Beatles played it earlier, then). Whatever the setlist, you always knew Maiden would deliver, and tonight they do, and in doing so they put themselves right back in the mix for the title of ultimate festival headliner. Take that Metallica, AC/DC and co.